„Jazz Fest Wien Vocal Award 2006"
Songs of love, sadness, joy, hope and desire played by a swinging band. 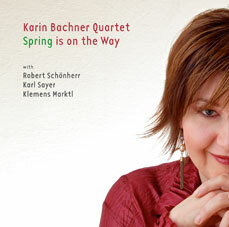 Karin Bachner (Jazz Festival Vienna Award 2006) introduces herself on this CD as both- a jazzsinger and a composer. She combines old swing tradition („Listen To My Story Babe“, „Blessed“) with modern jazz and odd meters ( „Out Of My Mind“, „Silent Words“, „Polkadots & Moonbeams“). You will find wellknown „Loverman“ in a latin way, you’ve never heard before. Bachners voice floats through the ballads („Spring Is on The Way“,“Love“) as a sailboat on a calm sea: gentle and touching at the same time.